Pray for the eight District Administrators as they lean into their roles for the newly restructured Oklahoma Conference. Be assured they approach the work prayerfully. The DAs serve full-time, making district offices more accessible and enabling District Superintendents to devote more time in the mission field. Summer office hours are 8 a.m.-5 p.m. Monday-Thursday. Beginning in September, the offices will be open 8:30-4:30 Monday-Friday. Brenda Scrivner describes herself as "an extreme pray-er." She told Contact, "I don’t do much of anything without prayer." She already was praying about a potential job change when she attended the 2014 Annual Conference as her church’s lay delegate and heard about the new district posts. She doubled down on talking with God. "I really wanted to get into some area I thought I could lend my expertise and still be in the area of (serving in) the church," Scrivner said. "I believe God led me here. I’m overwhelmed about how valued I feel." A church member for 30 years, Scrivner has an administrative background. She was treasurer at a Tulsa church and for 24 years at Verdigris UMC. The Scrivners live at Tiawah on 6 acres, about 8 miles from the district office at Claremore-First UMC. They enjoy camping and especially fishing. Their travel trailer is often set up at Lake Oologah. They have two adult sons. Jacklin Drake knew she would love working for the Church. When she interviewed, they began with prayer, she recalled excitedly. She managed an office 17 years for the family business, a construction company. Much prayer was involved in deciding to take on a new post. "The things we have faced in the last couple of years, we had to seek God’s direction," she said. Drake told God, "You’re going to have to drop it in my lap." The Drakes have three daughters and live in a new home on 2 acres north of McAlester. She leads the women’s ministry at a McAlester church. Like her mother and grandmother, Drake enjoys many forms of arts and crafts. "I love Pinterest!" The district office is located in First National Center, downtown McAlester. Stacie Turner commutes from Duncan to the district office in Lawton. She became Lawton District administrative assistant in 2011 and has noticed "the patience and love the people of the Church have." Their example gives this woman of faith "something to strive for: to be more like them," she said. Her work experience includes as being a construction project secretary for Duncan-First UMC, and she has an accounting background. Turner played competitive golf as a child. "I try new things all the time." She and her husband cook together, and she likes flower gardening. She grew up in Tulsa, then lived in Arkansas, before moving to Duncan. The Turners have an adult daughter and son. Kacey Hulin has come full circle with her new job. The district office is in Woodward, and that’s her hometown. The new post brought the Hulins back mere weeks ago, from Oklahoma City. Being closer to family is one of the blessings in that. Hulin grew up attending Woodward-First UMC, and the couple married there three years ago. District Superintendent Charlie Graves conducted that ceremony because he was the church’s pastor at the time! During the wedding, Hulin recalled, she had a giggle fit as her groom struggled to get the ring on her finger. Staying fit is important to her. The couple work out together at a gym. They have a Weimaraner dog. Hulin graduated from Oklahoma State University in hospitality management. She previously worked as a landman, which includes running titles on mineral rights ownership, and managed the front of the house at an Oklahoma City restaurant. Diane Bull relishes growing things for God. She volunteered 12 years for the Appalachian Service Project, leading youth teams that helped make homes warmer, drier, and safer in that region. She watched the youths grow, "and I grew, too." Bull said, "I enjoy working with kids. Outside of their element, they relax and get to know people, form relationships." Her son and daughter served on teams, too. In October, that daughter will marry. Bull retired after 37 years as a teacher. Last year, she was a substitute teacher at a men’s prison. The Bulls live on 15 acres, with room in the garden she tends – 100 by 120 feet – to maneuver a tractor between the rows. She tagged herself "an avid gardener," and admits randomly pulling weeds at other people’s homes. The district post trumps teaching, which is stressful, Bull said. However, the myriad United Methodist acronyms – "especially clergy classifications" – can be challenging! The office is located in Ponca City-Asbury UMC. Stacey Sprayberry has traveled the world and then survived tornadoes after the family settled in Moore in 1995. An OSU marketing graduate, she traveled as she worked 14 years for a gift wholesaler. She even went to Hong Kong and China. When the company relocated its headquarters to Oregon, she left that position. With a kindergarten-age son, the Sprayberrys began looking for a church home. They chose Moore-First UMC, and Sprayberry has worked part-time there. That’s a plus for her, because it’s where the district office also is located. "I know where the coffee is," she said. She’s busy with church closings as well as district changes following the realignment. She found valuable two days of training and meeting her counterparts, in June at the United Methodist Ministry Center in Oklahoma City. The Sprayberrys were building a home when the 1999 Moore tornado destroyed it. They opted to build on a different 1-acre lot. The 2013 Moore tornado caused $13,000 in damage to that home, but the family stayed safe in their storm shelter. Sprayberry still likes to travel. With their student-athlete son at college in Enid, the parents travel to baseball games. The family has two rescue pugs. Jill Perrin "came to faith" at age 14 and has been active in churches since then. "I’m a raging extrovert," she stated, "so it’s really exciting to see all the different manifestations of church." She sees God in all those expressions. A year ago, she became North Oklahoma City District administrative assistant. The Crossroads office is at the same location, in northwest Oklahoma City. Perrin expresses her faith through writing, too. She has created devotional material and curriculum. She wrote an Advent devotional resource for OKC-Church of the Servant. Her blog is "Sacramental Mothering." She has a liberal arts degree. She also is "a huge reader." The Perrins have lived in the northeastern U.S.; she led elementary-age children’s ministry at a Massachusetts church. The family moved to Oklahoma in 2011. Married almost 22 years, the couple has two teen daughters. Tee Higgins holds the longest term among the eight DAs. In 2003, she became Tulsa District administrative assistant and has worked with three superintendents. She’s a long-time church member, too: 35-plus years at St. Stephen’s UMC in Broken Arrow. Music is among her passions. She plays piano and guitar, sings in the church choir, sang for years in a show choir with her husband, and was in Sweet Adelines for 10 years. Higgins even admits to singing karaoke in nursing homes in the past. Quilting is another interest. She teaches a community quilting group that meets at Tulsa-Southern Hills UMC. The Higginses have two adult daughters and four grandchildren. "I love to come to work here," said the DA. The district office has remained at Tulsa-Asbury UMC, but Higgins’ duties did change. Council Oak District consists of more churches (52) than the former Tulsa District, and Higgins is learning to use new online church management software and "to answer the phone differently." Her background is in finance and administration. In the 1980s, she managed a supermarket with 52 employees. She also has been secretary at two churches in Tulsa. The eight district administrators meet together for training at the United Methodist Ministry Center in June. 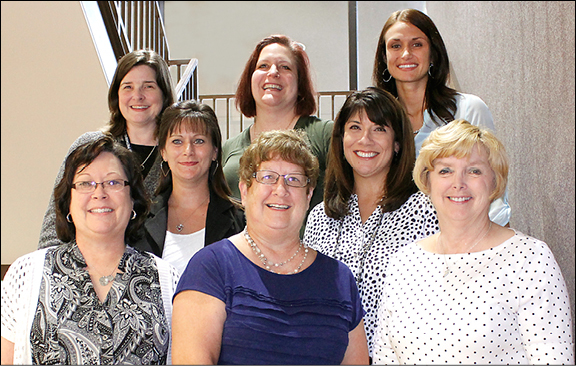 From left are: front row, Brenda Scrivner of Green Country District, Diane Bull of Northern Prairie, Tee Higgins of Council Oak; center, Jacklin Drake of Lake Country, Stacey Sprayberry of Heartland; and back, Stacie Turner of Wichitas, Jill Perrin of Crossroads, and Kacey Hulin of Cimarron.